A local group who prefers to remain somewhat anonymous (let's just call them the League of Extraordinary Gentlemen) decided to put on a very low-key Gentleman's Race, based onthe idea promulgated by Rapha. We had our share of excuses (interrupted training, new to pacelines, fat, underfed...), but we were game. The essence of a Gentleman's Race is something like a team time trial crossed with an alleycat at road race distances. This one started at Spanish Banks, and had two checkpoints, one in Richmond, one on the shore of Indian Arm on the Deep Cove side. (I've made a map with all the checkpoints marked. We chose to do the Iona checkpoint first, based on the belief that the crosstown ride would be easier in that direction. It was a defensible choice, but the organizers and most of the fast teams disagreed, believing the checkpoints should be done the other way around. We also chose to go to Richmond by going around UBC. Again, arguably defensible, but a choice to take a long detour away from the most direct route (and avoidable by choosing to do Indian Arm first). But we made our choices, and we ween't the only ones to think that way. The Iona pipeline was a ride I had never done. The Iona Road itself? Yes. The 4 km gravel path? No! And that's 4 km each way. The pipeline is a large, double-barrelled pipe carrying wastewater from a waste treatment plant out into the strait. You can either ride a gravel path beside the pipe, a gravel path straddling the pipes, or a foot-wide strip on the top of each pipe, but which has a steep drop-off down the side of each pipe on one side (your choice: 6-foot drop to gravel, or 2-foot drop to huge, sharp breakwater rocks). And oh yes, periodic obstacles including steel plates with prominent nuts and bolts, perfect for really vicious flat tires. 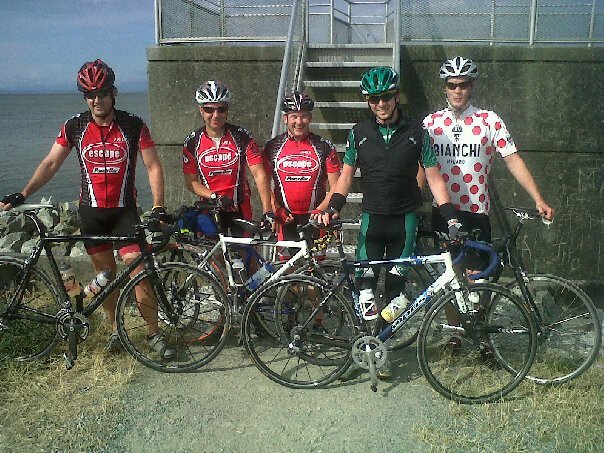 The team rode fairly well together considering our disparate skills and experiences, at least until we left Richmond (via the Canada Line bridge). After that, the climbs took their toll, but we stayed together. After a stop on Hastings Street just outside Chinatown for provisions, we carried on over the Second Narrows bridge. 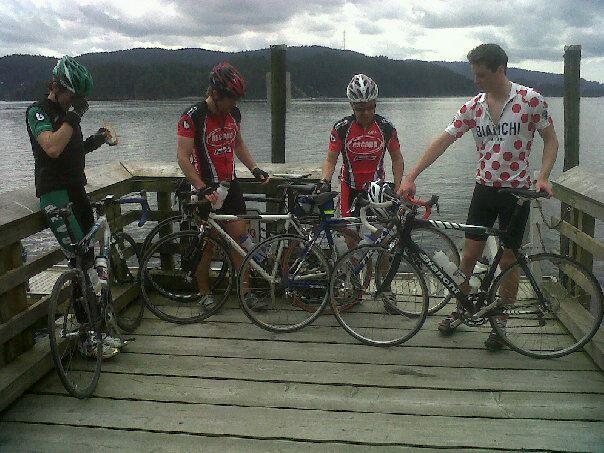 The climb in and out of the Indian Arm pier was also new to me, and nearly killed us all. I had to walk one steep section, and I was not the only one on the team. It was a tough grind, nursing our slow teammates and trying to stay together. Actual pacelining became sporadic as we approached the return to Second Narrows, and then Buttercup cramped badly. He should have used a more potent beverage in his bidons (I recommend the Radler: half beer, half 7-Up). Seriously shredded, we paced back to Spanish Banks as best we could, everyone feeling pain. Meanwhile, we were being paced by the same 2-man team of unattached riders that had dogged us all day, shadowing nearly the exact route as we did, though punctuated by a few questionable routing choices (Lions Gate Bridge? ), and one very good one: after we thought we had stolen a march on them when we met at Cypress and Cornwall, (see map notes) they wisely chose to cut through the shoreline park instead of heading back out to 4th Ave for the final push to Spanish Banks. That was enough for them to beat us by horrible seconds. They were far from the only ones to defeat us: a team of girls wearing skirts, the Ballistic Velo team, every other team except the presumed-DNF (but hilariously named) "Domestique Abuse" finished faster, despite 5-10 minute handicaps for some of them. But the ride was outstanding good fun, and the post-race BBQ was exquisitely catered (really, they could have served us grass clippings and sea water, and by then it would have tasted good). I am definitely doing this event every time they're willing to put one on.